With an aim to attract investors to its audiovisual industry, Cyprus launched “Olivewood”, as it has called its effort to establish itself internationally as a vast and varied film studio. The special framework of incentives and benefits drafted by the government for local and international productions, as well as the online platform “Film in Cyprus” (film.investcyprus.org.cy) with information and application forms, were presented on Wednesday during the Cyprus Film Summit in Nicosia. 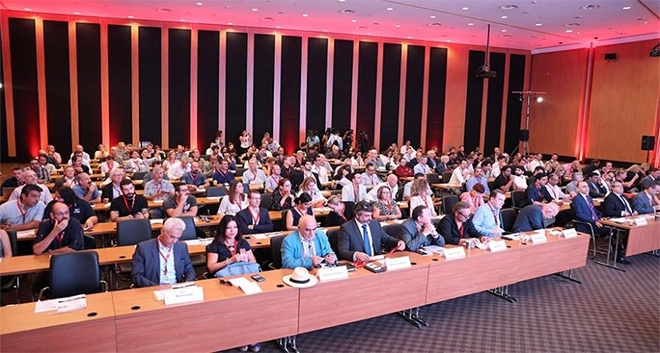 The Cyprus Film Summit was organised by Invest Cyprus, the Cyprus Tourism Organisation and the Press and Information Office, and was attended by producers and directors from Hollywood, Pinewood and Bollywood. Over 120 delegates from all over the world participated in the Summit. The Summit was opened by Minister of Finance Harris Georgiades, who elaborated on the prospects and comparative advantages of Cyprus. In statements to the press, Georgiades said the audiovisual sector could constitute a fresh opportunity for Cyprus, which he described as a “natural studio” with many economic advantages. In an address read out at the Summit, Chairman of Invest Cyprus Michalis Michael said Cyprus’ ambition was to dynamically enter the audiovisual market and establish the island as a top filming destination, opening up a whole new world of opportunities. Michael noted that Cyprus was a unique natural film studio in itself, and an attractive investment for any producer seeking a filming location. Chairman of the Cyprus Tourism Organisation Angelos Loizou said Cyprus was an attractive tourist destination and that its advantages would also interest the professionals of the audiovisual industry. Director of the Press and Information Office Sophie Michaelidou presented a promotional video titled “Cyprus: A Natural Film Studio” and referred to all the elements that made Cyprus a unique destination. Speaking to the press, Michaelidou said Cyprus was one of the best destinations for tourism and film investments alike. According to the Cyprus News Agency, the provisions of the incentive scheme were presented by Invest Cyprus officer Lefteris Eleftheriou, who announced that the Cyprus audiovisual industry would be called Olivewood, since the olive tree was firmly embedded in the island’s traditions. In the framework of the Summit, various visits have been organised to potential filming sites.